Nine years after launching on an Atlas V rocket from the Cape Canaveral Air Force Station in Florida, NASA’s New Horizons space probe has begun preliminary observations of the Plutonian system ahead of the probe’s arrival and first-ever human object flyby of the dwarf planet in July. The New Horizons mission is part of NASA’s New Frontiers program and a mission that stemmed from the cancellation of the Pluto Fast Flyby and Pluto Kuiper Express missions. The Pluto Fast Flyby mission was part of a concerted effort by NASA to study Pluto’s atmosphere before it froze to the ground as Pluto moved further away from the Sun in its orbit. The mission was originally set to launch in 2000 and reach Pluto by 2010; however, the mission was canceled due to lack of funding. Following cancellation of this mission, a replacement mission called Pluto Kuiper Express was conceived. This mission would have seen a probe fly by the Pluto-Charon system and at least one other large object in the Kuiper belt. Pluto Kuiper Express was designed to reach the Pluto-Charon system by 2012 or 2013 and would have mapped Pluto’s surface and examined the Plutonian system’s geology and geomorphology. Unlike the Pluto Fast Flyby mission which would have reached the then-planet in 2010, a 2012 or 2013 arrival of the Pluto Kuiper Express mission would have made a determination of the composition of Pluto’s atmosphere far more difficult because the planet’s atmosphere would have begun to freeze to the ground as Pluto moved further away from the Sun in its orbit. Regardless, NASA canceled the Pluto Kuiper Express mission in 2000 for budgetary reasons. The cancellation of this mission triggered a three-month concept study in 2001 for missions to Pluto. Two mission concepts were studied: New Horizons and POSSE (Pluto and Outer Solar System Explorer). On 8 June 2001, NASA announced that only New Horizons would proceed to the preliminary design study for the Pluto mission. 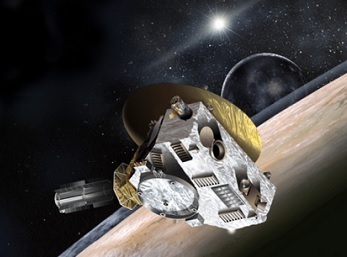 After formal approval for the mission, New Horizons was built by the Southwest Research Institute and the Johns Hopkins Applied Physics Laboratory (APL). Overall, the New Horizons spacecraft is the same general shape and size as a grand piano and has a triangular form that carries flight heritage from the Ulysses spacecraft as well as APL’s CONTOUR and TIMED spacecraft designs. Due to the operational needs of the spacecraft in the outer reaches of the solar system, New Horizons was designed to have limited electronic activity during its passage out of the inner solar system and to have an interior paint and exterior thermal blanket positioning to maximize heat retention in the outer solar system. One radioisotope thermoelectric generator (RTG) powers New Horizons’ systems. This RTG provided 250 W at launch and will still be producing 200 W by the time New Horizons encounters the Plutonian system in July 2015. The RTG contains 10.9 kg (24 lbs) of plutonium-238 oxide pellets — a lower amount than initially planned, which resulted in the re-planning of certain elements of the mission. To provide optimal protection, each of these plutonium-238 oxide pellets were covered by iridium and then encased in a graphite shell to prevent any accidental nuclear contamination of the atmosphere or launch site in the event of a launch failure. The U.S. Department of Energy monitored the launch closely and estimated that the chances of a launch accident resulting in the release of radiation into the atmosphere to be at 1 in 350. Worst-case scenario estimates of radiation exposure from a launch failure stood at 80 percent of the average annual dosage in North America received from background radiation spread over an area of 105 km (65 miles) from the point of a potential launch accident. Once in space, New Horizons’ attitude control was planned to occur through a spin stabilization during cruise stage or a three-axis stabilization during scientific modes. Both of these attitude control modes would be achieved through New Horizons’ 16 thrusters burning hydrazine monopropellant. Four of the thrusters on New Horizons were designed to provide 1.0 lbf and 12 thrusters were designed to produce 0.2 lbf. The larger thrusters were designed for course corrections while the smaller ones were designed for attitude control and spin up/spin down maneuvers. New Horizons was also fitted with two star cameras for fine attitude control during both spin stabilization and three-axis stabilization modes. The probe was also fitted with two Sun sensors for overall attitude control based on an angle to the Sun and measurements of spin rate and clocking. Above all spacecraft design, in order to fully support the scientific objectives of the mission, New Horizons was fitted with telecommunications and data handling systems to allow the spacecraft the most optimal communications with Earth during its tenure in the outer solar system. 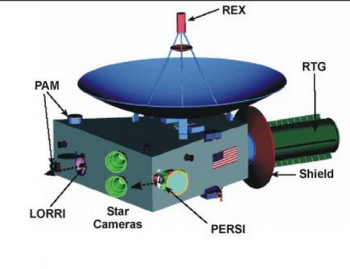 The X-band communications system chosen for New Horizons allowed the probe to obtain a communication rate of 38 kbit/s during its Jupiter flyby and an estimated, approximate communications rate of 1 kbit/s during its upcoming Plutonian system encounter. But most importantly for the mission and NASA was the science equipment chosen to achieve the mission’s scientific objectives. 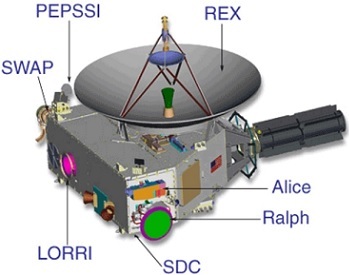 The seven scientific instruments chosen for New Horizons were the Long-Range Reconnaissance Imager (LORRI); the Pluto Exploration Remote Sensing Investigation (PERSI) platform, consisting of two instruments: the Ralph telescope and Alice; the Plasma and High-Energy Particles Spectrometer Suite (PAM), consisting of two instrument: SWAP (Solar Wind At Pluto) and PEPSSI (Pluto Energetic Particle Spectrometer Science Investigation); the Radio Science Experiment (REX); and the Venetia Burney Student Dust Counter (VBSDC). LORRI is designed to provide high-resolution images within the visual range using an 8.2 inch aperture camera for a resolution of approximately 1 asec (1.6km resolution). For the PERSI platform, the Ralph telescope will provide broadband and color channels in the visible light spectrum as well as near infrared imaging spectrometry while Alice (derived from an Alice unit on the ESA’s Rosetta mission) will provide ultraviolet imaging spectrometer capability to resolve 1024 wavelength bands in the far and extreme ultraviolet range. 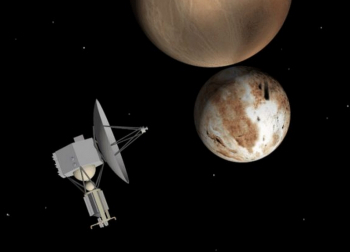 Both Ralph and Alice will help determine the composition of Pluto’s atmosphere. The PAM experiment and its two instruments will measure the particles of the solar wind and the concentration of those particles at Pluto’s distance from the Sun. REX, meanwhile, will allow for radio scientific observations of the dwarf planet. 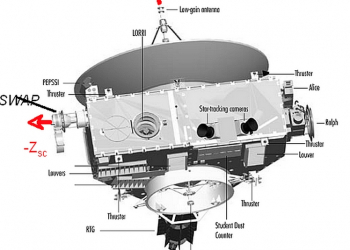 Lastly, VBSDC is a student to built experiment from the University of Colorado at Boulder designed to measure dust particle concentration throughout the entirety of New Horizons journey from the distance of Uranus’ orbit out into the Kuiper Belt. No dust collector instrument has ever operated successfully beyond the orbital bounds of Uranus, and models for dust accumulation and concentration in the outer solar system remain speculative. Thus, VBSDC will help validate those speculative models and help refine our understanding of dust concentrations in the outer solar system. Following completion of the build of the spacecraft, New Horizons shipped to the Cape Canaveral Air Force Station aboard a C-17 Globemaster III, arriving on 24 September 2005 for final launch preparations. Launch of New Horizons was initially targeted for the beginning of a 23-day window in January 2006 to allow for a gravity assist flyby of Jupiter. Back-up launch opportunities were secured for February 2006 and February 2007. However, those February launch dates would preclude a flyby of Jupiter and add two to four years travel time for the probe to Pluto. Final mission processing in 2005 initially targeted a launch date of 11 January 2006. However, that launch date slipped to 17 January to allow for inspections of the Atlas V launch rocket’s kerosene fuel tank. When inspections of the Atlas V rocket’s kerosene tank revealed no anomalies, launch operations proceeded toward 17 January but were foiled on the 17th due to unacceptable high winds at the pad. The second launch attempt on the 18th was subsequently scrubbed due to low clouds and technical difficulties unrelated to the Atlas V rocket. New Horizons successfully launched on the Atlas V 551 variant on 19 January 2006 at 14:00 EST from Launch Complex 41 at the Cape Canaveral Air Force Station, Florida. The five solid rocket motors and core stage of the Atlas V as well as the second stage Centaur successfully boosted New Horizons onto its initial trajectory before the Centaur second stage reignited at 14:30 EST to send New Horizons into an Earth-and-Solar escape trajectory. This escape maneuver was followed by an added third stage burn to boost New Horizons’ velocity to 58,536 km/h (36,373 mph). Thus, launch of New Horizon set a record for the highest launch speed of any human-made object from Earth, taking only nine hours to reach the moon’s orbit. With New Horizons safely on its way, toward the end of January 2006, mission controllers performed the first trajectory correction maneuver for the probe. The maneuver was so successful that the second trajectory correction maneuver was canceled. Initial onboard tests of three science instruments were performed on 20 February 2006, resulting in a clean bill of health for those three instruments. The third trajectory correction maneuver was performed on 9 March 2006, and by 7 April 2006, the spacecraft passed the orbit of Mars, moving away from the Sun at a relative velocity of 76,000 km/h (47,000 mph). As New Horizons cruised toward the asteroid belt by the middle of 2006, control teams scanned the spacecraft’s trajectory to see if it would, by complete chance, pass close enough to an asteroid to allow for observation. On 13 June 2006, New Horizons passed close to asteroid 132524 APL at a minimum distance of 101,867 km (63,297 miles). The incidental encounter allowed mission controllers and the scientific teams to use the Ralph telescope to make observations of the asteroid as well as test New Horizons’ observational and tracking systems ahead of the Jovian encounter in 2007 and arrival at Pluto in 2015. At the beginning of September 2006, New Horizons’ teams activated the LORRI to take its first long-range photographs of Jupiter at a distance of 291 million km (181 million miles). 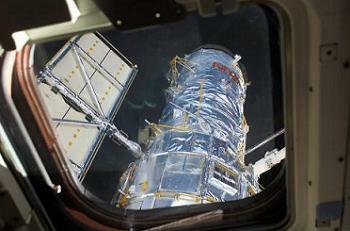 Formal observations, proximity operations, and experiment package testing with Jupiter began in January 2007. During proximity operations with the Jovian system, New Horizons’ scientists and mission controllers used Jupiter as a stand-in for Pluto to test the systems and spacecraft’s ability to perform automated maneuvers during planetary flyby operations. During the intense five-month observational campaign of Jupiter from mid-January through mid-June 2007, New Horizons’ team used the Jovian encounter as a dress rehearsal for the Plutonian encounter. Since New Horizons was outfitted with the latest state-of-the-art instruments that far exceeded the instrument capabilities of the Jupiter-dedicated Galileo mission of the 1990s, New Horizons returned significant scientific data about the Jovian system. This coupled with the probe’s still close proximity to Earth (allowing for faster and higher bandwidth communications) meant that New Horizons actually returned more scientific data about Jupiter than it is expected to return about Pluto. Of the data returned about Jupiter, New Horizons observed atmospheric conditions and analyzed the structures and composition of Jupiter’s clouds. The probe also discovered debris from recent collisions within the rings of Jupiter and searched for new rings and new moons around Jupiter. The search for new rings and moons revealed no previously undiscovered objects. 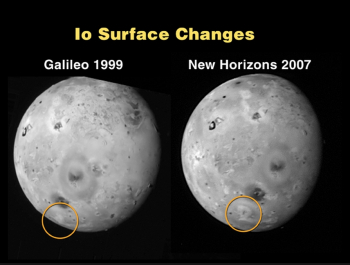 During the scientific observation of Jupiter, the New Horizons also observed the Jovian moons, particularly Io and Callisto. New Horizons captured 11 volcanic eruptions on the surface of Io, including one eruption that sent ejecta material to an altitude of 330km above the moon’s surface. Observations of Callisto helped define how lighting and viewing conditions affect infrared spectrum readings of surface water ice on the moon. Closest encounter with Jupiter occurred at 05:43:40 UTC on 28 February 2007 when New Horizons passed within 2.3 million kilometers (1.4 million miles) of the largest planet in the solar system. The probe’s trajectory during the flyby was meticulously designed to send New Horizons through a precise gravity assist slingshot maneuver around Jupiter to maintain the probe’s trajectory while increasing its speed by 14,000 km/h (9,000 mph), thereby accelerating the probe to a total velocity of 83,000 km/h (51,000 mph) relative to the Sun and shortening the probe’s journey to Pluto by three years. Following the probe’s encounter with Jupiter, the control teams commanded New Horizons into hibernation mode to preserve power as well as the scientific systems onboard the probe. 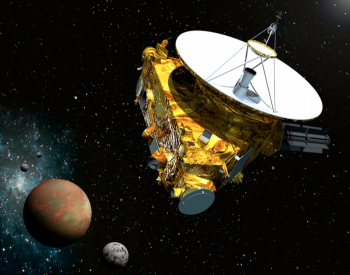 From 2007 through 2014, New Horizons spent a majority of its time in hibernation, awakened by its flight control team periodically for a series of tests to ensure that its systems were still operational. In terms of traveling time, New Horizons crossed the orbital boundary of Saturn on 8 June 2008 and the orbit of Uranus on 18 March 2011. Following the crossing of Uranus’ orbit, astronomers studying the Plutonian system announced the discovery of two previously unknown moons of Pluto. 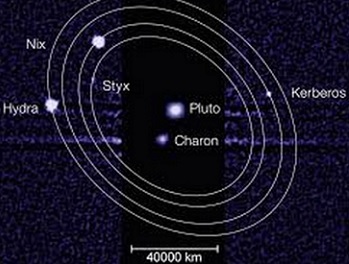 Previous long-range observations of the Plutonian system by the Hubble Space Telescope had revealed no indication of these moons. Mission planners became concerned about the possibility of New Horizons running into unseen debris in the Plutonian system. To this end, numerous Earth-based telescopes as well as the Hubble Space Telescope where aimed at Pluto to determine the possibility of a catastrophic collision with debris or dust within the system. The observations yielded a 0.3 percent chance of a catastrophic collision with an object in the Plutonian system. By 20 July 2014, during one of the non-hibernation phases of the cruise stage, New Horizons successfully imaged Pluto and Charon as two distinct bodies in orbit of each other from a distance of 2.8 AU. This marked the first time that New Horizons’ cameras discerned the two bodies as distinct objects. On 25 August 2014, the probe successfully passed Neptune’s orbital distance. 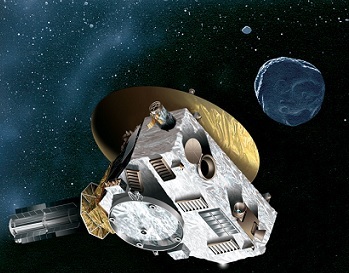 On 6 December 2014, NASA awakened New Horizons from hibernation to begin regular operations and preparations for the mid-year 2015 arrival at the Plutonian system. Distance operations began on 4 January 2015, and the probe commenced long-range observations of a small Kuiper belt object designated VNH0004. As New Horizons nears Pluto, the probe will also be used to observe a second Kuiper belt object in June and a third Kuiper belt object in September after the flyby of Pluto. On 15 January 2015, New Horizons began observing the Plutonian system as a whole; however, the main scientific phase of the mission will not until February 2015 with dedicated observation of Pluto. Although the main scientific part of the mission will begin in February, it will not be until 5 May 2015 until New Horizons’ cameras are able to provide high-resolution images of Pluto and Charon that exceeded the best images yet taken of the system by the Hubble Space Telescope. New Horizons will make its closest approach to Pluto on 14 July 2015 at approximately 11:50 UTC (6:50 a.m. Eastern Daylight Time in the United States). As New Horizons makes it close flyby of the Plutonian system, the probe is expected to fly within 10,000km (6,200 miles) of Pluto itself. At that time, New Horizons will pass Pluto with the relative velocity of 49,600 km/h (30,800 mph). Furthermore, the probe is expected to come within 17,000 miles of Charon. During and immediately after the close encounter, the low bandwidth will result in a one-way communication lag of approximately 4.5 hours. This lag in communication with Earth and the need to point all instruments (including the main communications antenna) toward Pluto and away from Earth during the flyby will result in a delayed return of scientific data and images from New Horizons of the dwarf planet. During the mission’s conception, build, and launch, New Horizons was always intended to be the first human-made mission to visit the ninth and as-yet only unexplored planet in our solar system. However, just eight months after New Horizons’ launch, the International Astronomical Union (IAU) officially adopted a definition for a planet. In the definition, the IAU stated that a celestial object must meet all three defining parameters of a planet in order to achieve planet status. Those three characteristics defined a planet as a celestial body which: orbits the Sun, has sufficient mass to assume hydrostatic equilibrium (be near round in shape), and has “cleared the neighbourhood” around its orbit. Pluto met only two of those three characteristics as it has not cleared the neighbourhood around its orbit. This is due in large part to Pluto’s relatively small size and the fact that it resides within the Kuiper belt of known trans-Neptunian objects and more accurately fits the definition of a Kuiper belt object and then it does a planet. Thus, in September 2006, meeting two of the three characteristics for planet-hood, Pluto was reclassified by the IAU from planet to dwarf planet. 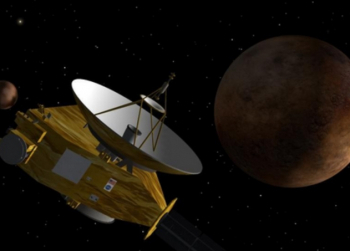 Unfortunately for New Horizons, it will not even be the first space probe to reach a dwarf planet. That distinction will go to NASA’s Dawn spacecraft which is set to arrive in orbit around the dwarf planet Ceres in the asteroid belt on 6 March 2015, just four months prior to New Horizons’ arrival at Pluto. However, New Horizons will be the first human-made object to reach and explore a Kuiper belt object, and its in-situ observations will be extremely important in helping us better understand the planetary characteristics and interactions between Pluto and Charon. In fact, New Horizons will help further our understanding of the interactions between Pluto and Charon in terms of the possible redefinition of Charon as a dwarf planet as well. At the same IAU conference in 2006, some astronomers pushed for Charon to be defined as a planet or dwarf planet as well. This stemmed from the fact that Charon has an unusually high mass for a moon when compared to its host planet (be it a dwarf planet or a major planet). In fact, Charon is so massive (11.6 percent the mass of Pluto) that Pluto and Charon actually orbit each other instead of Charon orbiting Pluto (the barycenter of Pluto and Charon lies outside both bodies, and thus they each orbit the other). As New Horizons observed Pluto and Charon up close, the information returned from New Horizons could provide confirmation that Pluto and Charon are actually both dwarf planets, making them the first ever detected dual planetary system (in both the major planet and dwarf planet categories).